Great idea for parties. 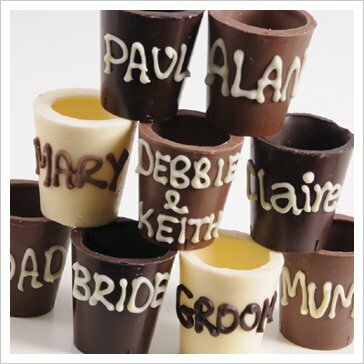 Each Chocolate Shot Glass can be hand piped with a different name. Perfect for place settings. Hand made to order, each shot glass is thick enough to be actually used with drinks, then you can eat them! We recommend Vodka or Sambuca! Price includes bespoke hand piped text in a contrasting chocolate colour. Just send us a list of names via post or email. Each shot glass is presented in a clear acetate box and tied with ribbon. You can choose the colour of the ribbon by notifying us via email. Size 5cm x 5cm, these are approx 30g of thick chocolate!